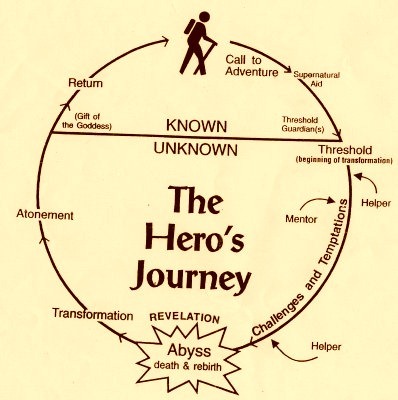 The Hero’s Journey. Part I. You can attribute this particular journey to just about every hero in both our classic and popular cultures, as the principle applies to young men and women like Oliver Twist to Princess Leia Organa to Harry Potter—our de facto heroes. Not every journey needs to end where it began (and most don’t), but the reality is that often times these heroes are thrust out of their mundane day-to-day and thrust into an adventure that tests everything they once knew. Now, am I comparing myself to one of these heroes? Absolutely not (although Leia and I are both gifted with incredible accuracy with firearms—nerd joke!). But I find myself falling into Campbell’s archetype quite seamlessly. Allow me to explain. Andrew Munz, 23, moved from his hometown of Jackson, Wyoming to explore a whole new life in Chicago, Illinois, the city of improv, deep dish pizza, and incredible public transportation. The big bad skyscrapers loomed to the East, and I was ready to leave my sheltered existence and learn what real life was all about. I had a goal in mind—fuel my improv passion—and I sold everything to prepare for my new venture into city life. And then I hopped on a one-way flight without an apartment, a job, or a solid plan to welcome me. It was the ultimate journey and I was ready. Five months later, Andrew Munz, 24, writes from a Starbucks in quaint Lincoln Square, quite possibly the most neighborhoodly of all the Chicago neighborhoods. Families, dogs on leashes, and smiles travel down the clean sidewalks and pass the local restaurants and mom & pop shoppes. Sirens aren’t common and taxis are hard to come by (which is totally fine if you’re terrified of taxis, still, after five months). In Campbell terms, I’m currently experiencing my own version of “supernatural wonders”, and there couldn’t be a better way to describe my experiences because, compared to how I grew up, the adjustment has been bizarre. Not bizarre in the way that an African excursion would be bizarre for an Alaskan, but in the way a young man from Tattooine would feel on Coruscant (oh my heck, Star Wars joke #2!). But what of the “decisive victory” that Campbell writes about? For even the strongest of warriors or heroes, no battle is more difficult than that of self discovery. The common questions of “Who Am I?” and “What Do I Want?” come up in everyone’s life, and they’re admittedly the hardest to answer. If we look back on my heroic examples, even those in your head that I didn’t mention, each one emerges from their journey with “the power to bestow boons on his fellow man” (hahaha…boons! Never gets old!). In this instance *deep breath* boons are figurative gifts, and sometimes literal gifts. In my interpretation, they’ve acquired a good dose of knowledge that they are now able to share with others, and I feel like I’m ready to do that. In my next blog (The Hero’s Journey. Part II.) I will talk about how moving to Chicago has allowed me to achieve my own decisive victory and answer those two self-defining questions. I will also write about how I believe my Monomyth is ready to come to an end and will lead me back home. Yay! We miss u Andy! Come home! Andrew the way you write is amazing! So proud of you……Love ya!